Violent, deadly storms have swept across the country. 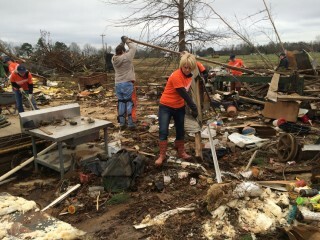 Our staff and volunteers are bringing comfort and helping clean up in Mississippi and Texas. 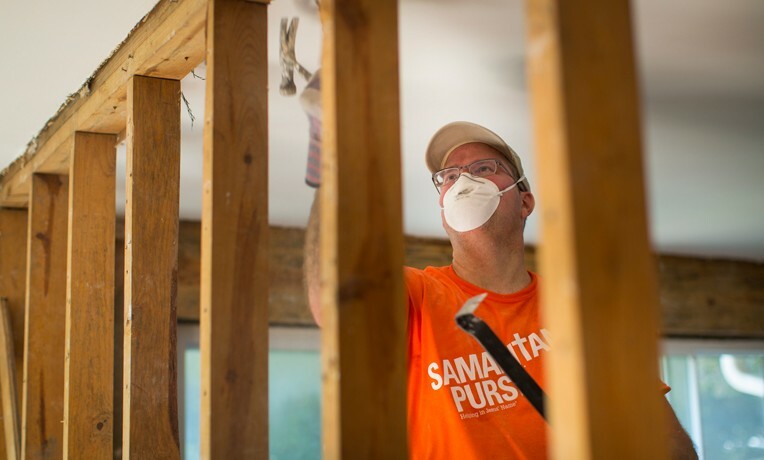 Samaritan’s Purse has personnel and disaster relief units on the ground in both Texas and Mississippi following several days of deadly storms. 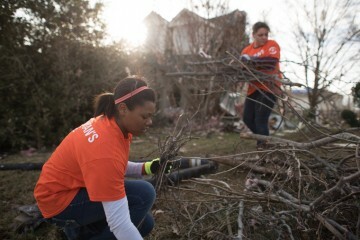 Our volunteer teams are hard at work in both states, spreading out around the Dallas area and northern Mississippi to help suffering homeowners with cleanup and to minister to them in the Name of Jesus Christ. Volunteers began arriving and working on December 30 at our three relief bases. Already, we’ve logged thousands of hours of labor and seen multiple people saved by Christ. Our teams are helping homeowners in the Dallas suburbs. Samaritan’s Purse has one tractor-trailer unit—packed wall-to-wall with heavy-duty tarps, generators, and other tools and supplies—based at Lake Ridge Bible Church in Mesquite, Texas. Volunteers here are focused on assisting devastated homeowners in the Garland/Rowlett area. A second, similarly stocked relief unit is based out of Eastridge Baptist Church in Red Oak, Texas. From there, volunteer teams are ministering in the Desoto/Glen Heights area. More than 1,500 homes have been damaged or destroyed in the Greater Dallas region. A third Samaritan’s Purse tractor-trailer is based at Ashland Baptist Church in northern Mississippi, also hit hard by the severe storms. One long-track EF-3 tornado ripped through the rural countryside there, and more than 275 homes are reported to have damage. We are working in a three-county area around Ashland. One of our volunteer teams hard at work in northern Mississippi. Billy Graham Rapid Response Team chaplains are also on site to comfort homeowners and provide emotional and spiritual care. Since December 23, many states have been pummeled by unusual weather and more than 40 people have died. Unseasonable warmth spawned tornadoes that were followed by crippling blizzards. Now flooding is a problem. Last updated January 2, 2016.